To be in with a chance of winning a cool prize you need to email me your orders before 10pm tomorrow night. Read more about it here and GOOD LUCK !!! I haven't got time to stop and create nothing with the new goodies yet so but I do have to share a few projects made with one of my fave stamp sets from the new catalogue JUST BELIEVE !!! These were projects made for our team training last month ahead the catty launch. Rubbish photos I'm afraid, this was our technique project and we played with watercolour paper and our fabulous markers, the effect is gorgeous and the combo really FAB> I used the colour coach once again ( I LOVE IT !) and it told me that Cajun Craze should go well with More Mustard and Pear Pizzaz, and it does indeed, very warm combo the ladies really liked it as well. 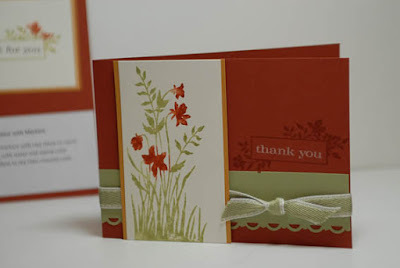 Pear Pizzaz poly ribbon and that wonderful lacy border punch, the new punches are yumm yum. 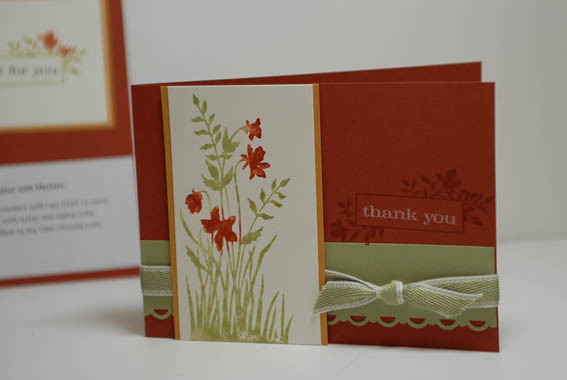 Again the Colour Coach suggested that I paired Baja Breeze with Cherry Cobbler and Soft Suede, and that's what I have used on this card. The small polka dot background was stamped in whisper white ink on the soft suede. 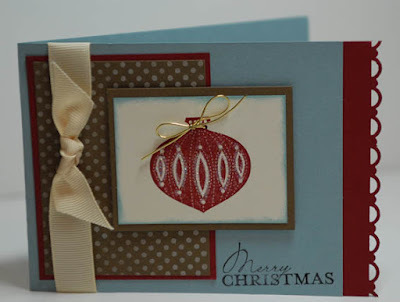 Vanilla grosgrain ribbon bauble stamped in cherry Cobbler ink onto very vanilla card. Our third project was a simple 3D desk post it holder that is showcasing the fabulous Greenhouse Gala designer paper. 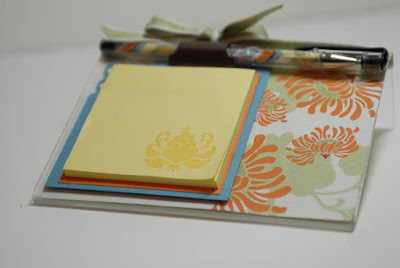 I also decorated a plain pen with some matching designer paper and stamped the corners of the post it notes with the matching set Ornate Flowers. Thank you so much for being patient with me and I will hopefully see you again very soon with some worthy eye candy. some lovely projects there, glad you are having lots of parties.